Lost in the Movies (formerly The Dancing Image): So what's so special about Oct. 22, 2010?? So what's so special about Oct. 22, 2010?? Here's a story that might resonate with all you bloggers who check your stats addictively. 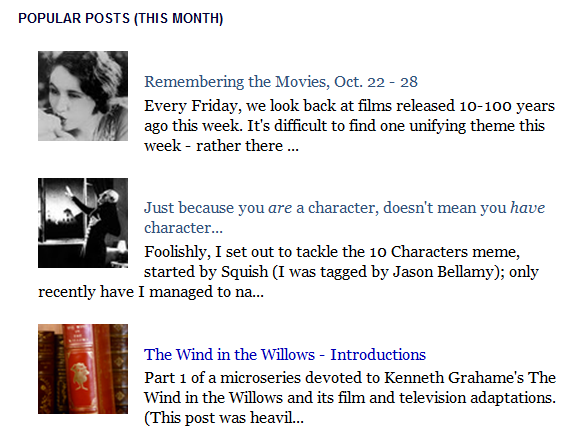 It's been clear for a while that certain posts receive way more hits than others: in particular my introductory Willows piece from last fall and my "40 Characters" entry from two years ago have proved perennially popular. Obviously the primary reason is image content - Google searches yield hits on certain pictures I included and users who click through find themselves on my site. Also certain posts - like the Characters one - were promoted or linked up at various sites (though it's fallen off lately, the picture gallery meme and "Reading the Movies" rode high for a while on these links as well). Yet there's one post that, lately, has been crushing all the others, and for the life of me I can't figure out why. It's a Remembering the Movies entry from October 22, 2010, with L'Age d'Or the highlighted film and Malena and The Magnificent Seven among the other movies mentioned. This is before I took my new, flashier approach to the series so there aren't a whole lot of images. None of the titles would necessarily be expected to generate lots of hits - it's not like The Godfather or Star Wars is featured. Yet, especially in the past month or so, no other single piece has been nearly as popular. Finally I have to ask, what's going on here? Has one person bookmarked the page and used it as an entry to the site ever since? Is there a Monica Belluci fan who uses it for motivational purposes every day? In fact, when I look at the "traffic sources" option, there are no incoming links that stand out, so I can't imagine one person is generating all this activity. I'm genuinely curious, so if any of you have looked at this post for a particular reason - aside from stumbling across it while otherwise using my blog - can you let me in on the secret? Sounds like it might be a spam referrer. I get loads of them at my Wordpress blog. My guess is it's the Monica Bellucci pic, especially as it includes her full name. At my place a review of The Ring (also from last October) has a picture of Amber Tamblyn and though the pic name does not include her name it does have the entire name of the movie (usually I label my pics with fragments of titles and/or artists). On days when it comes up on a Google search of her name and that movie (seems to be a matter of rotation, some days it does, some days not), it's still driving traffic like crazy and makes me feel like somehow I cheated. Although now and then some of those visitors seem to be sticking around and evidently reading, so there's that too. Thanks, JPK - I like that idea much better than the notion that it's just spam! I mean, who doesn't like Monica Bellucci? Re: Monica Bellucci... indeed. It's a funny old world out here on the Internet. So few read, but everybody's looking. I wanted to mention how glad I am that you bubbled up your Twin Peaks series, as it prompted me to finally open up my copy of the gold box that I got so cheaply a few months ago. I was an irregular fan way back but had forgotten much of it and missed many episodes anyway. It's been a real eye-opener returning to it again and I look forward to going through all your pieces more carefully once I'm through it. The intro pieces are great, and I love what some of the commenters bring too, such as Tony Dayoub. UPDATE: Looking at traffic sources in the stat section, I feel confident in saying that it's definitely Monica Belluci who's driving the traffic.